I entered two of my encaustic monotypes into the “Construct” show at Artserve in Ft. Lauderdale. My membership to Artserve will expire in Sept. It was last year’s birthday present to myself. I had been a bit disappointed by the “call to artists” that they had all year. I decided to be selective of how and where I place my work. I attend many of the artshows at the local guilds, and even thought they have a theme, I never can see it in the art that is on display. Maybe it is just me. So I decide to submit my small prints (4″ x 4″) into the show. The theme “Construct” was asking for artwork that would be used for home decoration. Since my prints have that “look” of decorator art (again, what I think it should be) I decided to put in 2 pieces. One piece I had professionally framed. This piece was going to be my “showcase” piece, so that people can see how a tiny piece of work, when framed, can create a look. My second piece I framed myself in a small frame. So I enter and a week later I attend the opening. I go, the gallery is packed and do not see my work hanging, so I thought, “Oh great, rejected again” as I start to leave a fellow artist, Susan Clifton, says, hey AJ congratulations and I say for what, my art is not even hanging. 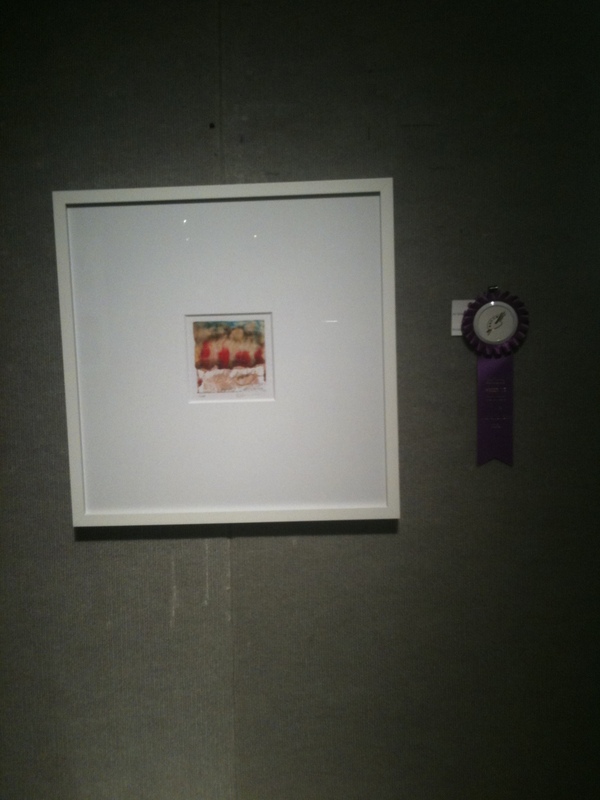 It was behind her work and she said in the program it stated I won best in show. The reception started at 6, but I didn’t get there until 7 and all the programs had been distributed. I was amazed.I met the Judge, an architect and painter from Germany who teaches at the university in Boca Raton. He wanted to know how I did it and loved the piece. Even the Board of Directors came up to me and said, it was unanimous, when we had the final selection, we all said “that one” . And what did I win, a full year’s membership to Artserve. But what I really got out of it was confidence and validation. The highs and lows of the art world.